Solar thermia means converting the thermal energy of the sun in electric power. In contrast to photovoltaics whose strength is self-dependent systems in the lower output ranges, solar thermal power plants even today generate hundreds of megawatts of electric power. 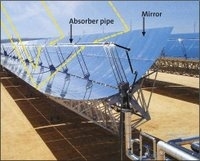 Only solar thermia holds the potential to replace fossil fuels. The cost for generating electric power is at least 3 to 5 times lower with solar thermia than with photovoltaics. It is the perfect solution to very large scale projects. Todays concentrated thermal solar power technology is very efficient and cost effective, it has the potential to generate huge amounts of clean, renewable electricity by using heat and steam, as in traditional power plants, but without any pollution side effects.. Given the right, strategic location and the necessary surface, 24 hour operation, 365 days a year, is a very realistic proposition, thanks' to large scale thermal storage for night and cloudy situations. On the MARE platform, this technology will be implemented for a maximum economy of scale, the available surface being enormous. World Banks' estimate of construction cost reductions being of the order of 50% compared to existing installations. The energy produced this way will be very competitive in today's and tomorrows markets, even when NOT factoring in the benefits for the environment and health ! 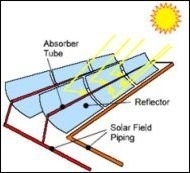 Today parabolic trough power plants represent the most efficient and cost-effective technology for turning solar energy into electric power that has been proven on an industrial scale. 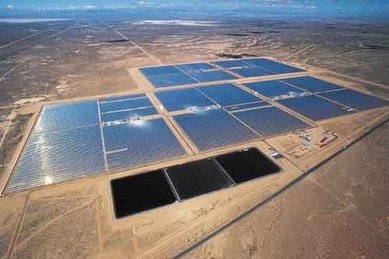 In the plants already operating in California, net efficiency rates of more than 20% in summer and more than 14% as the annual average have been achieved in turning insolation energy into electric power. 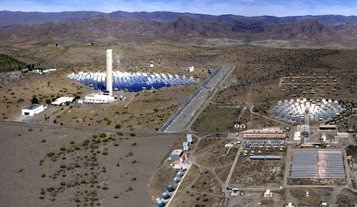 The German Aerospace center has continuously been improving this efficiency over the years in Spain (Almeria). Additionally, according to recent World Bank studies there is a cost reduction potential for parabolic troughs of up to 50%. In comparison to that, marketed photovoltaic systems achieve annual averages in southern countries of 8 to 10%.